Trailing 4-1 in the third period, Brunswick rallied for four unanswered goals to top Berkshire by a 5-4 margin on Senior Day in Hartong Rink on Saturday. The two teams combined for 14 penalties in the spirited, high-scoring contest. Ahead of the Brunswick rally, Berkshire built a 4-1 lead after two periods. Trailing by three goals in the final 18 minutes of action, the Bruins started their four-goal comeback on a goal by Paul Davey at 14:40. Brunswick’s Matthew McGroarty and Davey followed with solo markers on power-play chances over the next 10 minutes, as the Bruins tied the game at 4-4 with 4:28 left on the clock. Henry Foster notched the go-ahead goal for the Bruins with 3:00 remaining to cap the remarkable, Senior Day comeback. 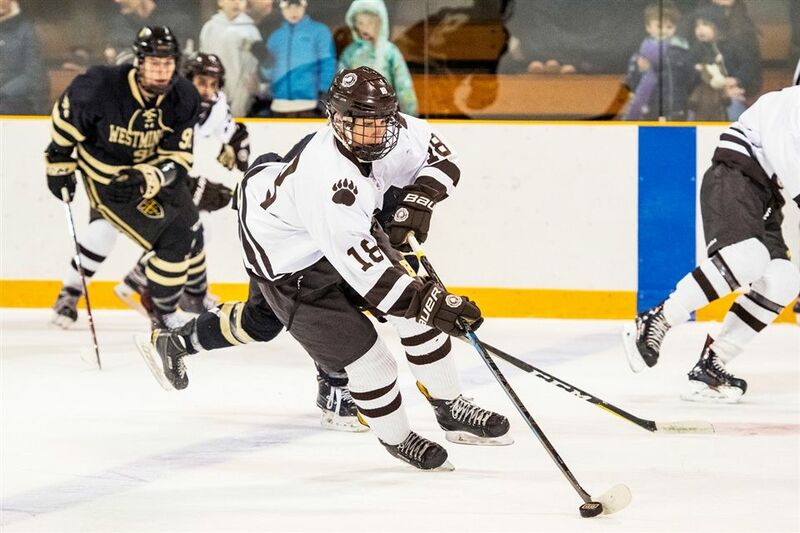 Brunswick fought off a late power-play opportunity by Berkshire, as the Bears also pulled their goalie in the final minute for another skater.